Well, I said I wouldn’t do it, but who was I kidding? 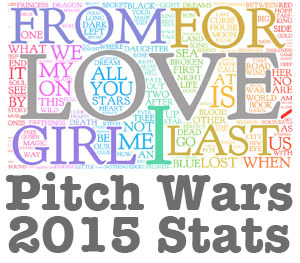 I couldn’t resist the urge to dig into the numbers of Pitch Wars 2015. After all, we had a record year: 1,591 submissions for 101 mentors. It means that we mentors have a lot of reading to do, and some difficult decisions to make. We get only a single mentee this year (no alternates), which makes that even harder. 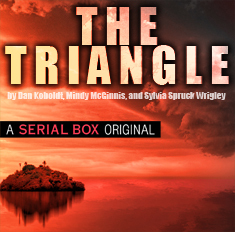 Of course, we understand the angst that the submitting authors must enduring while we read. A lot of us have been there (on the submission side) ourselves. But it’s good practice, because the publishing industry involves a lot of waiting. And a lot of rejection, too, now that I think about it. Consider this a test of your authorial professionalism. Now, on to the numbers. A disclaimer: this is a quick-and-dirty analysis of the submissions inbox. Parsing all of that data may have introduced some errors, and I haven’t done much to do things like correct duplicate entries. In other words, this information is for entertainment purposes only. 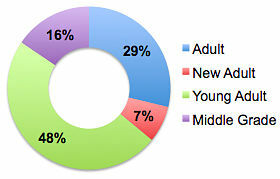 The age category breakdown should surprise no one, because it’s very similar to last year’s numbers: young adult predominates (48% of submissions), followed by adult (29%) and middle grade (16%). New adult remains the minority by a fair margin, representing just 7% of submissions. One difference with this year’s form, designed by the ever-capable Brenda Drake, is that the genre field was a free-form text box. I understand this decision: last year’s pull-down menu was the source of many comments/questions during the submissions window. 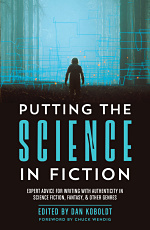 The upside of a free-form genre field is that it reduces that angst a little bit, and puts the onus on the authors. The downside, of course, is that it removes any kind of standardization. And it allows people to play the old game of make-up-a-genre. Yet this again is a test of sorts: an author who’s done his or her homework knows how to pick one (and only one) valid genre. So, after a bit of normalization on my part, I compiled the top eleven genres. Why eleven? Because I wanted Horror to get on there, and because I could. 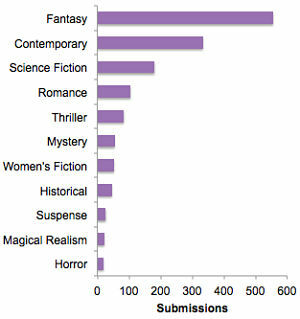 The top three submitted genres were fantasy, contemporary, and science fiction. The entire top list is very similar to last year’s. Jeez, I should have just copied all of last year’s results and saved a lot of time. All right, I did have a bit of fun making this one, because frequency distribution plots are my jam. I didn’t bother breaking it down by age category or anything, so these numbers will be skewed a bit by that. And yes, there were real submissions with super-low and super-high word counts. Sometimes it’s a typo, and sometimes it’s not. Here’s something else I thought you might enjoy, a word cloud based on the titles of all submissions. It’s what I used to make the header image, but here’s a larger version. I didn’t manipulate the data for this one, other than removing common words (“a”, “the”, “etc”). 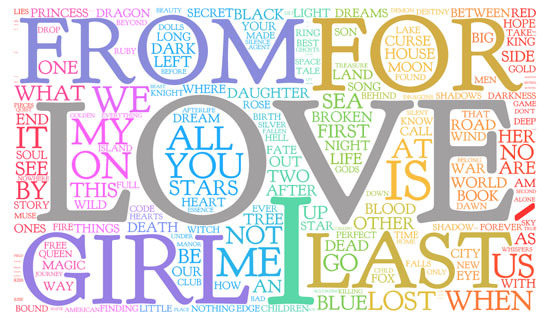 The most-frequent word really was love. And that, somehow, seems just about right to me. Ok, I’m a nerd, but I’m loving the statistics, graphs, and charts. I even found one of my title words way down in the corner. Happy thoughts on a dreary Monday! This is impressive! It appeals to the Pitch War stalker in me in beautiful ways! Thank you! Kudos to you for doing this, Dan! 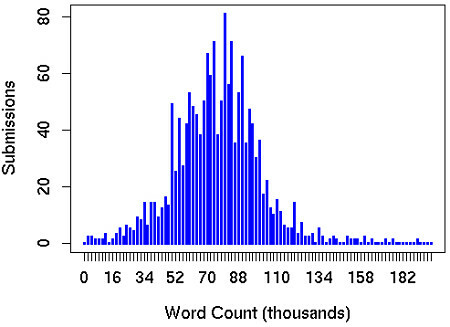 If you’re feeling up to it after the Pitch Wars picks are made, I would be very curious to learn how many manuscripts (if any) with prologues and/over 100K word count are selected and in what genres. This might be valuable information to guide future entrants. Thank you for your time and effort. Thanks, Anne! That seems like a very specific question. I’ll let someone else tackle it. I do love a good chart. 🙂 thanks for working the stats for us. it’s interesting to see what other writers are doing.